If you’re planning a Disney World vacation, November may seem like a good option. And the good news is that, well, you’re right! November provides all sorts of unique events and opportunities for you and your family to enjoy. What’s more, despite all the excitement, the parks remain relatively clear of crowds. Of course, there are days you should avoid, but overall you won’t be too bothered by masses of people. In this guide, you’ll learn everything you need to know about traveling to Disney in November. From what the weather will be like to which events cause the most traffic, no stone will be left unturned. That’s right, even in Florida fall has arrived. While it may not follow the typical autumnal weather trends—highs of 60s, lows of 50s—Orlando still experiences a welcome drop in temperatures. Generally, you can expect highs in the 70s and lows in the upper 50s. Beautiful weather for walking around the parks! Rain is also scarce in November; you can travel to Disney with little rain gear and stay dry. It is Florida, so rain may fall while you’re there, but November has the least amount of rain out of all the months. Always check the weather before your trip just to be extra sure, but you shouldn’t worry about adverse weather too much. Because of the drop in temperatures and the reduced rainfall, you can expect a slight boost in crowds on the coolest days. Note that these days will not get as crowded as the summer months, though. Remember, it’s November. Kids are in school! 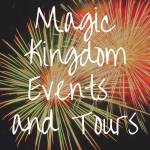 November is one of the busiest months at Disney in terms of events. Though, none of these activities directly relate to November. In other words, November is often the end of the summer events and the beginning of the winter holiday season. Epcot’s International Food & Wine Festival: You’ll catch the tail end of this festival if you plan your trip for the first or second week in November. You certainly won’t be short on places to eat in Disney World for this event. Even luckier, this means that the crowds will have died down significantly. The festival starts in August, so people have had plenty of time to visit this event before November hits. Disney Wine & Dine Half Marathon: Again, this one occurs at the beginning of November to signal the completion of the Food & Wine Festival. You can expect more crowds in Epcot the day of the race, but other than that, you won’t even notice it’s happening! Thanksgiving: You may assume that Thanksgiving receives a lot of attention at Disney. Not the case! November, to Disney at least, acts as pre-December, meaning pre-Christmas. You can expect some special menus and reduced prices at various restaurants, but not much more than that. Luckily, you won’t experience an increase in crowds because of Thanksgiving. Mickey’s Very Merry Christmas Party: This is the event that will start bringing in crowds. The festivities don’t really start until the end of the month, so that’s when the crowds will be at their highest but the joyful season starts right at the beginning of November. The decorations go up the day after Thanksgiving, so if you plan on staying at Disney near the end of the month, you’ll get to see all of the Christmas cheer. Holidays Around the World at Epcot: Unlike the Christmas buzz, the other holiday parties don’t start until late November, and they are limited to Epcot. Because of this, the crowds will be more concentrated there. Overall, though, you won’t see too many crowd increases from this event. From all that information, you can pretty much tell when parks are going to have more crowds. But if you’re looking for a more detailed breakdown, this part of the guide will be your best friend. 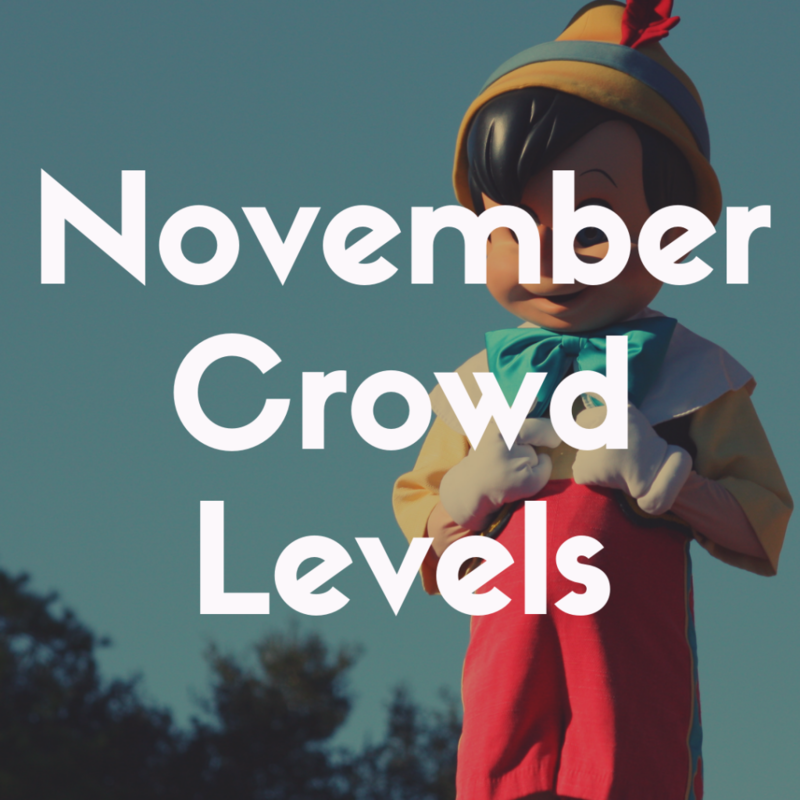 In November, you’ll be battling event crowds, mostly. When there aren’t any festivals going on, the crowds are relatively low. The first and second weeks in November are going to be your best option. Even though the Christmas season has technically started, not many people are going to want to experience Christmas at the beginning of November. Because of this, crowds are going to start thinner at the beginning of the month, making the first two weeks some of the best to visit the parks. In the middle of November, around the beginning of the third week, you’ll start to see an increase in people. By then, word has gone around about the holiday season and everyone will start buying up Christmas event tickets as soon as they can. In other words, this is the week everyone thinks is the start of the Christmas season. Because of that, people will concentrate their visits to the third week in November and later. As for the fourth week in November, you’re better off avoiding it if you can. Christmas is getting closer, the decorations are up, and everyone will want to start getting in the Christmas spirit. And the other holiday parties at Epcot will have started by the fourth week, so crowds will be coming in for those events as well. Think of it as the Black Friday edition of Disney. 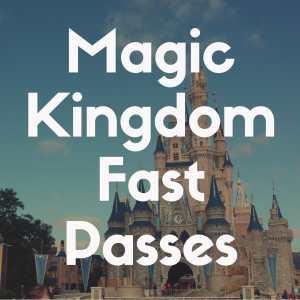 Everyone wants to experience the magic, and everyone wants to make sure they get in their fun before the holidays actually start. You don’t want to be a part of this crowd, so try your best to pick dates earlier in the month. Like the resort as a whole, each of the four Disney parks have good and bad days to visit. In November, Epcot and Magic Kingdom are going to be the busiest because of all the special activities going on, but there are still better days than others to go to those fun-filled parks. 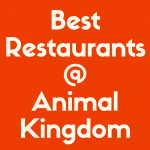 Let’s start with Animal Kingdom, though. 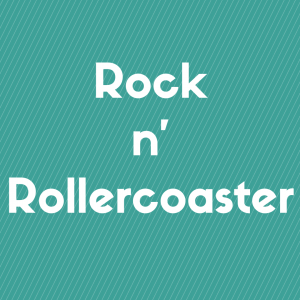 Because temperatures are cooler in November, this park polarizes guests. Families will either flock there because it’s nice and cool, or they’ll avoid it at all costs because it’s too cold to traverse through the jungle in 60 degree weather. If you decide you are of the latter persuasion, feel free to skip Animal Kingdom entirely. There isn’t much going on in November, and some of the animals aren’t available for viewing because of the temperatures. However, if you really want to go to this park, then you’ve got a few options. Mondays, Thursdays, and Fridays are best to go to Animal Kingdom. You’ll see why in the Magic Kingdom and Epcot sections below. But for now let’s go to Disney’s Hollywood Studios. Again, this park doesn’t have many exciting events going on in November, so overall the crowds will be less than in Epcot or Magic Kingdom. You can expect the least busy days to be Tuesday and Wednesday, but Monday and Friday are also good choices. Now for the two big ones: Epcot and Magic Kingdom. As stated multiple times throughout this article, these two parks have a lot going on in November; therefore, they are the hardest to plan around. In general, these are the two busiest parks regardless of events, so it’s already difficult to find good days to visit. But with the additional events, it can start looking like a jigsaw puzzle. Whatever you decide to do, try your absolute best to avoid these parks on Mondays, Tuesdays, Fridays, and the weekend. You may be thinking, “That sure doesn’t leave much, does it?” And you’d be right. But the point of planning your trip down to the day is to make everything work together. Knowing the busy days of the other parks lets you limit your choices for the busier days at these parks. You may notice that the least busy days for other parks happen to be the busier days for Epcot and Magic Kingdom. This means that the days everyone else is at Animal Kingdom or Hollywood Studios, you’ll have Epcot and Magic Kingdom to yourself. Well, yourself and anyone else who notices that pattern. You may have noticed that the weekend was left out of the previous section’s schedule. No, that wasn’t an accident, it was very much so on purpose. Weekends are by far the most crowded days at any given park in Disney. This is because of people who live in Florida and want to spend a day or two at the parks. Not everyone visiting Disney stays at one of the hotels, and not everyone is on vacation. Some people just go to Disney as a day trip, like you would at your local amusement park. Because of this, the weekends are jam packed with people. What does this mean for your vacation, though? Firstly, don’t feel sad if you were hoping to have a fun weekend at Disney; event dates occur throughout the week, and there’s always something special going on no matter what day you visit. Secondly, you can put your weekends to good use by avoiding the parks on these days. Use the weekend as your travel days. Whether you’re flying into Florida or driving, you are going to need to dedicate some time to traveling and getting settled. The weekend is perfect for this. You’ll only be missing out on the huge crowds. Plus, if you’re flying, airline tickets are usually cheaper on the weekends. Again, this is for the same reason why everyone flocks to the parks for the weekend. No one wants to spend their weekend traveling. But, with careful planning, it won’t matter that you’re traveling on the weekend because you’ve got each park planned down to the day. The rest of the week will be your weekend. If you’re looking for an event-filled, relaxed trip to Disney, November is a pretty decent time to plan your trip. 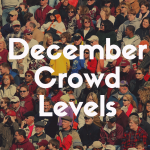 As long as you avoid the later weeks of the month, you should be able to navigate through the crowds with ease. If you have no interest in the events in November, though, you may want to pick another month to visit the parks. No matter what, you’ll experience at least some event traffic, and it can be frustrating to deal with if you have no interest whatsoever in the event in questions. A good example of this is the Wine & Dine Half Marathon. Not every park goer is going to be participating in the race, and it’s likely that the viewers will mostly be the friends and family of the racers. So if you aren’t a part of this crowd, you may find yourself getting irritated at all the people crowded around to watch the race. This is just one example, but it’s applicable to the other events as well. If this isn’t an issue, though, then November is a great time to go to Disney. It’s cool, exciting, and full of the magic of the holiday season. What more could you ask for?